At Amriza, our goal is to bring you creative and unique items for yourself and your home. Whether you have a style all of your own or are looking for one, you will find items that are sure to please. From handmade jewelry to adorn yourself, to handpainted items to decorate your home, we have a wide and growing selection of products for you to choose from. Look for lots of crochet in Spring and Summer 2006 fashion collections. 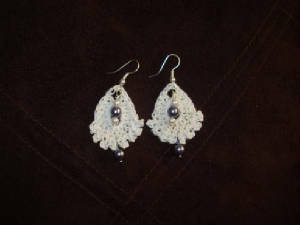 Be it a crocheted belt, sweater, shrug or poncho, our delicate crochet earrings with beads will compliment every look. Available in many colors.